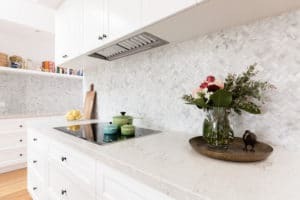 Home » Blog » Granite vs. Marble: What Surface is Right for My Kitchen Counters? 2019 is as good a time as any to renovate your home. If you’ve had your eye on a designer kitchen for some time, you know that in order to make the elegant statement you’re looking for, you can’t sacrifice on the quality of materials used. While choosing flooring and cabinets is a big decision, countertops are by far the biggest statement piece in kitchens. There are countless options when it comes to countertops, but marble and granite are some of the most popular due to their durability and stunning appearance of the natural stone material. When it comes to appearance, both granite and marble countertops are going to make a statement in your kitchen. Granite is known for showing more grains and specks that vary in hue. This means you will see blue, green, red, pink, and orange in various shades throughout the natural stone. Marble, on the other hand, tends to show larger patterns, which means that colors are more consistent with veins running through. That being said, beauty really is in the eye of the beholder so the natural stone slab that is right for you really depends on your style preferences. When it comes to countertops, granite is a harder natural stone than marble. This means it is more resistant to scratches, chips, and cracks. That being said, both materials are fairly hard and more durable than other countertop options. They are also heat resistant, though you should be careful not to set hot pots and pans down directly on the counter. Something else to keep in mind when you are selecting the right countertops for your new dream kitchen is how much maintenance each requires. Both granite and marble need to be sealed every one or two years to prevent stains because they are porous so liquids can penetrate. However, when compared to other solid surfaces like laminate, quartz, glass or ceramic tile, granite requires moderate maintenance while marble is higher in maintenance. Looks and maintenance aside, what truly sets marble and granite apart is the price. Granite prices start around $60 to $75 per square foot, while marble is closer to $100 per square foot installed. Prices also depend on whether you get them from your local home improvement store or venture into a store that specializes in natural stone. As a rule of thumb though, no matter where you go, you’ll pay more for marble countertops than you will for granite. If you are looking to determine the right natural stone for your new dream kitchen, contact the experts at Advanced Stone & Tile Restorations. Simply call (714) 917-5255, and our professionals will walk you through the stone selection and fabrication process. With over years in the business, you can trust Advanced Stone & Tile Restorations to help you every step of the way! To learn more about our natural stone fabrication and restoration services, visit us on the web at Advance Stone & Tile Restorations .